Summing up J.D. Salinger's life's work is impossible—as he would be glad to know—because we've seen so little of it. That is, if the tales of his continued writing for decades after he stopped publishing in the 1960s are true. One account has him late in life claiming to have written fifteen novels he never published. But we have been left with only two early novels, The Catcher in the Rye (1951) and Franny and Zooey (1961)—and it's debatable whether the latter is a novel, a novella or just a pair of stories. We also have from that time nearly a dozen acknowledged stories collected between book covers and a few more printed in magazines but not anthologized. But many of these, like the Franny and Zooey pieces, read more like disjointed chapters in a large family saga, following the seven children of Salinger's fictional Glass family. Salinger, of course, was famously the epitome of the reclusive author. But he took it further than others, considering the very act of publication an invasion of his privacy. He wrote just for himself and protected his work by not publishing, he said in a rare interview. Which is nonsense and a trap, in my view. Whenever anyone uses literary forms, one is writing for a public, either real or imagined. Without having a reader somewhere in mind, no one would make the effort to manipulate the shared language and the formats established to demonstrate character, environment and human interaction. You could jot notes to yourself, make lists, use symbols that only you understand, develop a private language, or spend your days in daydreams and verbal masturbation. But if you're a writer, you're writing for some public. Salinger's last known publication, "Hap worth 16, 1924", took up nearly an entire issue of the The New Yorker in 1965. The public and critics found it a long-winded, verbose, nearly incomprehensible story in the form of a letter from camp, purportedly composed by seven-year-old Seymour Glass, though also possibly edited or entirely written later by his brother Buddy, a Salinger alter ego. It was a long way from the first Glass story in the same periodical, "A Perfect Day for Bananafish" (1948, collected in 55 Short Stories from the New Yorker in 1949 and in Salinger's own Nine Stories in 1953), which sharply and affectingly told the story of thirty-year-old Seymour's last day. 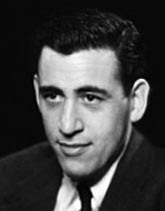 Salinger worked willingly with editors then to shape his startlingly original story into comprehensible form and the result made his reputation as a writer to watch. The Catcher in the Rye, which sealed his reputation with the pulic, was a novel quite different from his Glass and veteran stories. The account of a prep school dropout in New York was like nothing anyone had written before. The mundane experiences of the disaffected Holden Caulfield are related in his own ironical voice speaking colloquially and directly to the reader with scarcely a word breaking character until close to the end, a stunning achievement whose style has been much copied. The boy's droll critiques of all the "phonies" he runs across at school and at large have appealed to generations of alienated young people ever since. Salinger never published such a successful work again. The Nine Stories collection and Franny and Zooey (published as a book in 1961 but actually having appeared as two pieces in The New Yorker in the mid-1950s) were well received. Writers have cited the stories as influencing their own styles. 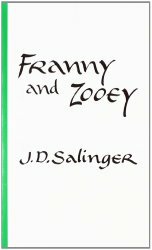 Franny and Zooey are also noteworthy for introducing some obscure religious notions, especially about continuous prayer, into Salinger's work. 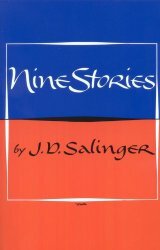 In 1963 Salinger's last book collected another two short novellas or long stories from the 1950s. 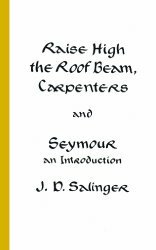 Raise High the Roof Beam, Carpenters is a meandering but engaging story of soldier-on-leave Buddy Glass hanging out with wedding guests after the bridegroom, his older brother Seymour, has failed to appear at the wedding. Seymour: an Introduction is Buddy's denser, stream of consciousness riff on his sibling's early life, recounted after the events related in "A Perfect Day for Bananafish" and touching on Eastern religious ideas. This book too sold well, such was the hunger for anything from Salinger, though praise fell off with each publication since The Catcher in the Rye. The even more difficult "Hapworth 16, 1924" was the last straw for readers and critics—and for Salinger. After the negative reaction, plans to reprint it were scrapped several times and it remains unpublished in book form. Given the trajectory of his published work, it might be guessed that Salinger's private scribblings in the last five decades of his life descended further into self-referential, internal monologuing about the improbable Glass family and mysticism. Or not. We may never know. Since Salinger's death, there have been rumblings of all his works being released but so far only a few old stories have surfaced. So, an assessment of Salinger's impact comes down to one profoundly trend-setting novel and a handful of striking stories. For those alone, produced when he was a young man, Salinger is considered a major literary figure of the modern era. That slight oeuvre changed the course of American writing for a post-war generation as radically as had Ernest Hemingway's more numerous novels and stories for the previous post-war generation.